So I wrote a little note about all about our little anniversary trip to Paris earlier this week, but I thought I would do a more specific post about our stay at The Hoxton Paris because, honestly - it deserves it's own special place on here. Also, I had way to many photos because I fell head over heels with the interiors. I knew when the trip was being planned that I wanted to stay at The Hoxton Paris, having stayed in both the Shoreditch and Holborn hotels - I was aware of the standard and general trendiness of the hotel. Just by pure luck really when we were working the other week Hayley noticed that The Hoxton had reached 100k on Instagram and as a treat they released a code which made any night's stay just £99. Obviously I scrambled over to their site and booked a night, making a bloody giant saving. I think the thing that surprised me most about The Hoxton Paris was how it was completely on brand, yet had its own unique individuality. It felt homely like the other hotels I'd stayed in, it had the same buzz, friendliness and amazing standard but, also felt really true to it's surroundings. We arrived a little after the check in time as we were eager to get in and have a little explore of the hotel and chill before heading out to dinner. Upon arrival we were told that they had upgraded our room, which was super exciting - we had an incredible room with a view and even a little cosy velvet sofa. The receptionist was so friendly and asked about our visit, I mentioned we were there for our anniversary in passing and she gave some recommendations on things to do whilst we were there. We popped out bought a bottle of red and headed back to the room to get ready slowly, there was a knock at the door - low and behold, reception had sent a bottle of champagne up to our room as it was our anniversary. It was the nicest little touch and something I will never forget. It's always the small things that people do that stick with you. Needless to say, it didn't take long for the champagne to disappear. So the room we stayed in I believe was a Cosy, but honestly it felt rather roomy - so I would be intregued to find out what a Roomy or a Biggy is like! It was very typically Hoxton styling, deep colours and warm feel. The bed was big, with gorgeous checked minimal bedding, a velvet bench sofa in the window view and oh my goodness, parkay flooring which now I really crave at home. As always the bathroom was pretty much the main event for me. I do love me a fancy bathroom, the tiles were so gorgeous and the rainfall giant shower room was everything after a chilly days walk around Paris. Also, the brass finishes on the taps etc. to die for. 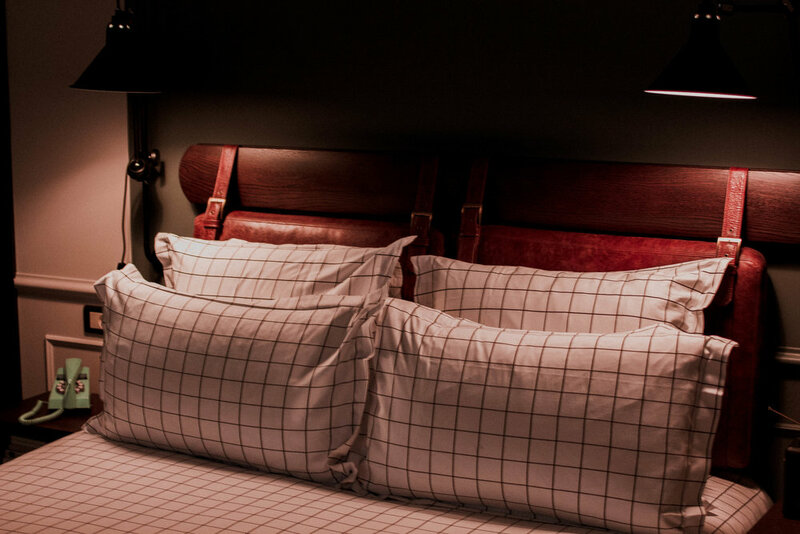 I mean if you want a room which will make you feel all inspired for interiors, has good tea available and generally is just the most Instagrammable space, then you really need to book into The Hoxton, Paris. Well first things first, The Hoxton Paris is a playground for those of you into interiors, the design features leave you feeling inspired and rather snap happy. I never knew I needed to mix wicker with velvet before, and now it's all I can think about. Also on the interiors note, I appreciate the amount of greenery, it's a place after my own heart. Usually I'm an advocate of getting out and about in the city your in and not just having your meals at the hotel, but I broke this rule for brunch at Rivie, the on site restaurant. I'd heard good things about it and just couldn't resit. No regrets here, we had a spacious table and spent a while eating brunch, chatting and sipping on some seriously delicious coffee. Another thing to note is how brilliant their little speakeasy bar is - Jacques' Bar. Hidden away upstairs in the far corner of the hotel is the most gorgeous little space dedicated to good cocktails. We went up there to see what was going on and though we would have one drink, ended up there for a fair amount of time with lots to drink. Honestly, if you're staying or not - it's worth a drink there! Ergh, all I want to do is get back to Paris ASAP. P.s. Have you signed up for Slow Sunday Club yet? The third edition comes out Sunday 11th February. Where an Earth Did February Go? And Other Notes. pop your email address in and receive a newsletter every sunday, for all things chill.